The Ice is still open at Discovery Green. You can go any day to skate for $12 or go Monday after 4:00pm for $5.00 Cheap Skate. Skate rentals are included in the prices. On Friday night, you can catch a free film, Smirfs 2, and watch it from the ice or dry land. Also, on Saturday, you can take a break from skating and visit the Discovery Green Flea Market or Young Writer’s Workshop. 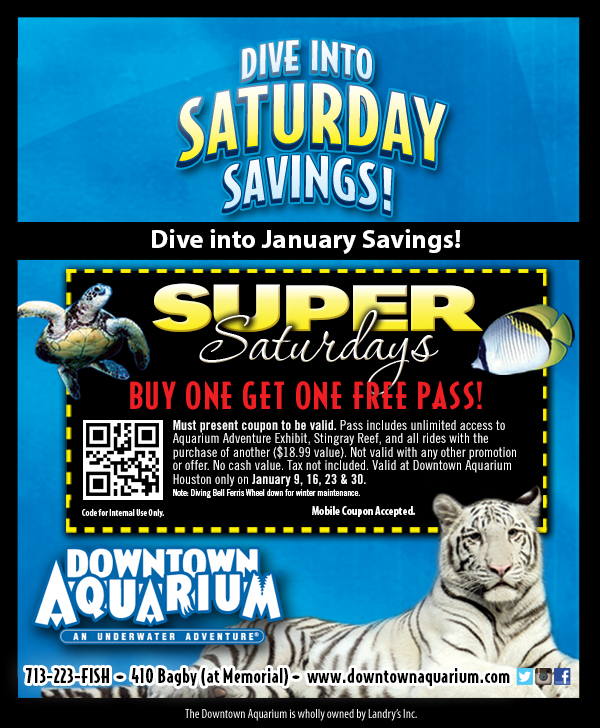 The Downtown Aquarium has brought back the Super Saturday deal. Print THIS coupon to get buy-one-get-one-free admission. Two can enter for $16.99 and have unlimited access to all rides and activities. The Houston Arboretum has a Family Owl Prowl on Saturday. Also, the Nature Discovery Center is kicking off their new series of classes, including one for preschoolers, one for older kids and a free weekly storytime. Finally, if you are up for a little drive to Galveston, visit Texas Marine Mammal Stranding Network for a free family event called Dolphin Days. This real dolphin rescue facility will open up and teach families about mammal rehabilitation and research! There will be mock stranding demonstrations, face painting, real marine mammal bones and more! I have a few kids that would think this was great fun. Look below for the full list of events and go HERE to get it delivered to your inbox each week.